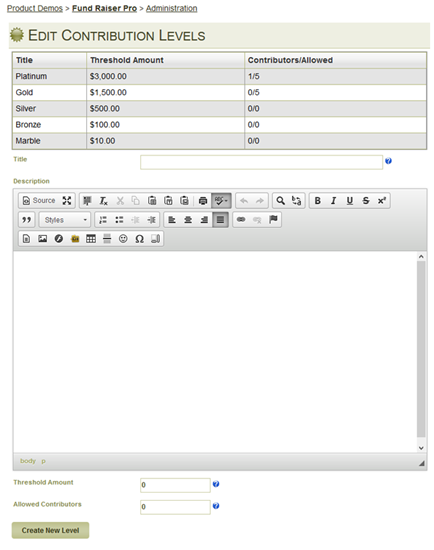 Fund Raiser Pro is an add-on feature for the free and open source mojoPortal content management system. It provides the tools you need to do fundraising/crowdfunding on your own website. It has similar functionality to sites like Kickstarter.com and indiegogo.com but you host it on your own site and control it yourself and collect payments via PayPal or any of the eCommerce gateways supported in mojoPortal. You can also define contribution levels and/or allow users to contribute any amount they want (within lower and upper limits that you can define). Your fundraising campaign can have a target date for reaching a fundraising goal or it can be open ended with no end date, or you can change the end date if you need more time to achieve the fundraising goal. 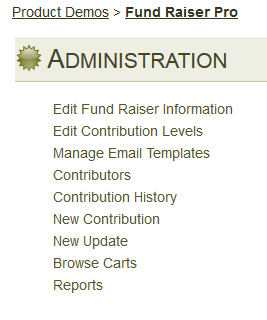 You can show or hide progress toward your fundraising goal, you can show or hide contributor profiles. Contributors can control their own privacy settings for what is shown in the contributor profile and the administrative settings allow you to make things even more private. That is, you can hide information that users marked as not hidden, but you cannot show information that the user chose not to show. For example, the contributor can show or not show their name, city, state, country, and contribution amount for example. As administrator of the site, you could choose not to show the city and state and country even if the contributor said it was ok to share that information. In some cases, you may want to show the contribution amount, in other cases you may not or the contributor may not want to show that information. You can optionally allow users to edit their own contribution profile or change privacy settings. You can also allow people to post comments and you can post updates to keep people informed on the progress of the campaign or project. You could also use the mojoPortal Newsletter feature to keep in touch with your contributors and encourage additional contributions. If you have defined levels and are allowing users to contribute arbitrary amounts, then a subsequent contribution can move a contributor up to a higher level by aggregating with his or her previous contributions. There is also integrated social sharing using the add this widget to encourage sharing your campaign on social networks such as Facebook and twitter. You can try it out on our demo site to test both the front end for contributing and the back end for managing the fundraising campaign. Fund Raiser Pro requires mojoPortal 2.4.0.9 or higher hosted with ASP.NET 4.5 or higher using either MS SQL or MySql for the database. If you need support for another database platform let us know, depending on demand we may add support for other database platforms that are currently supported by mojoPortal CMS.